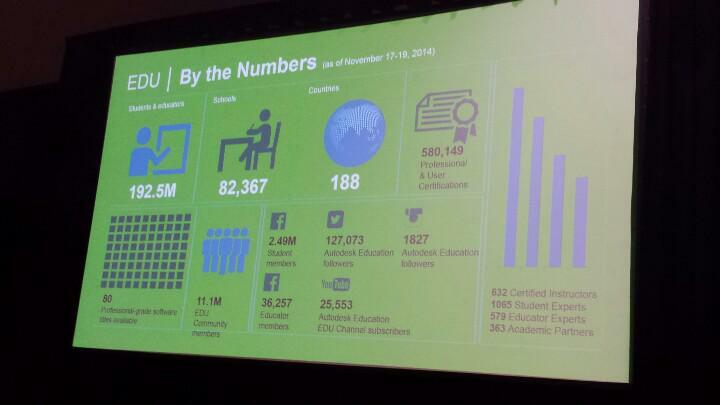 The first day started off with the Education Keynote. Chris Bradshaw of Autodesk hosted the event. So much good information at the event. See images below for some of the slide deck. 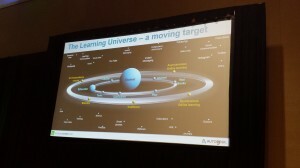 This is the Learning Universe – what tools we have to learn from. 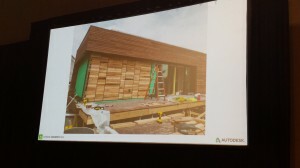 This image and the one below were from a sustainable design educational contest where students used Revit tools to design a green building. I then attended the Freshman Orientation hosted by Lynn Allen. She informed a packed house of new attendees on the highlights to not miss for the week. She discussed the AU2014 App that everyone is using. It is packed full of info. Even if you are not attending, you can follow the stream of info and tap into many items. One tool in the App is the Survey tools that she used throughout the presentation. Quick surveys that displayed the results on screen as they were happening. At the Freshman event, I met three design professionals for Turkey – Tunc, Onur and Erkan. They work at Dome + Partners, a design firm located in Istanbul, Turkey. They do mixed use, theme parks, high rise and much more. This was their first AU… Check out their designs at http://www.dome.ws. I also met Jeffrey Muhammad, a Professor at Austin Community College. He is teaching Civil3D to students in Texas. Innovation Forums were mentioned as the focus of the major presentations from Autodesk. AUGI was mentioned as a premiere community for networking after the event. Lynn also discussed the Answer bar, Meetup lounges and more. Certification exams are being offered for free and there was a really long line already. Many taking the opportunity to test their skills and gain a certification that can be added to their resume. 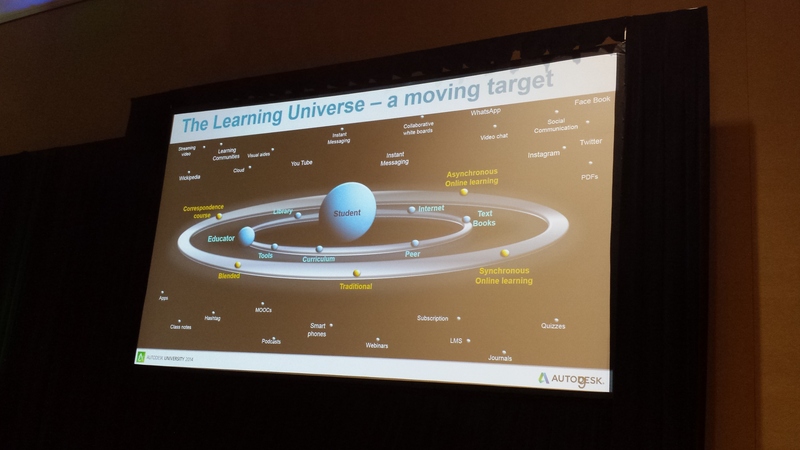 Autodesk also discussed the Voice of the Customer. They are testing out new designs and feature, sneak peeks, and they want to listen to your input. Round tables and interviews are being scheduled so that Autodesk can get direct input from uses. Check the schedule to see how you might get involved. So many ways to connect. So many ways to learn. This is promising to be a great event again this year. I ended the night at a Media Reception where I discussed Revit and other BIM tools with Scott Latch, the Building Platform Product Manager. He said that the Revit team is still striving for new goals in the tools we all use. 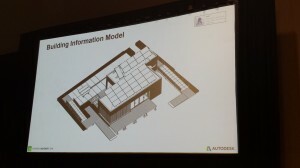 He outlined one – Skyscraper – that is available as a Revit collaboration toll. You can read more here. It is a cloud tool that has many features for scattered teams and partners. 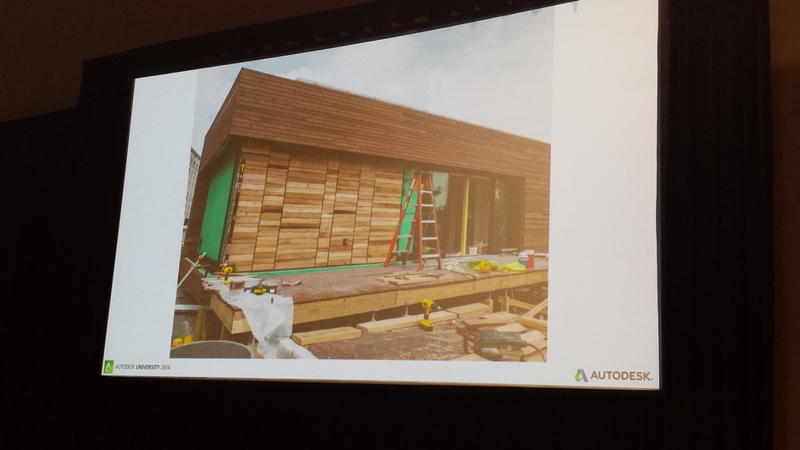 Look for more on this from Autodesk at this conference. Well – tomorrow is looking to be very crowded. I hope to see some of you and to keep the rest informed via my posts. Follow me on Twitter for news as the day progresses.